This content management system, WordPress, has made sure that just about everything on its platform is easy to conduct. Do you want to create a database or manage one on WordPress? This is one of those automated processes that should never stress you. There is no need of hiring a battalion of computer experts to do that work for you. On the contrary, you can do a number of things on WordPress on your own like creating the databases and even managing them. The only problem is that you might have a bit of an issue while starting out. There are few things that you need to understand before you create those databases like how WordPress uses the database. How does WordPress use database? 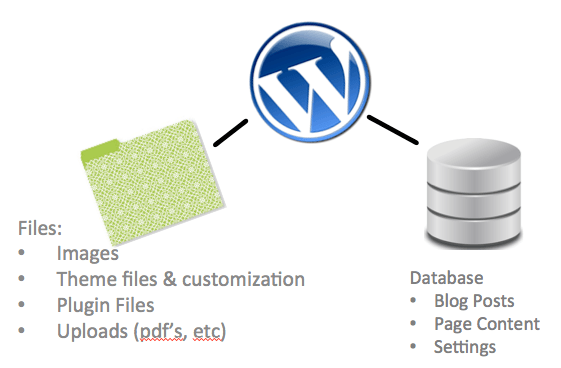 Basically, WordPress uses PHP to store and retrieve the data that is stored in a database. The information that is stored in the database includes everything from posts and comments to tags and users. If you have ever heard the phrase that the internet never forgets then this is clear evidence of that. A database can store just about all details concerning activities on your website. This information can be retrieved when you need it. WordPress uses MySQL as the database management system. PHP is just the scripting language of the platform. You do not need to understand how the two work, but then a basic understanding will always come in handy. It will help you increase your understanding of how WordPress works while at the same time helping you to troubleshoot problems that might arise. When WordPress is first installed, it requests you to create a database name, username, password as well as the host. This information that you provide is going to be used in the creation of tables in the database as well as storing default installation data inside these tables. Once installation has been completed, the system then runs queries to this database. The goal is to generate HTML pages for your website. You will not have to create a new .html file for all the pages that you want to add. Everything is handled automatically. There are several routes that you can take to database management. There is always the option of hiring a database administrator to work on your website fulltime. This is especially convenient if you have a company website or just a busy website that brings in a lot of money. No one wants to lose money simply because of database malfunctions or such related issues. This is why database management is of great importance. Before going any farther into this article, it is worth pointing out that data is a very important asset to any business. Therefore, database management is not only about staring at the database and expecting a problem to occur. It involves everything from collection of the data to its integration into the database. Luckily, WordPress does just about everything for you here. Therefore, you will not have to struggle much with the capturing of data. The system will do that work for you. However, you will still need to keep a close eye on the database. People have lost a lot of money simply because the database malfunctions. When you have a person paying close attention to your database for you, then you are assured that you will never have an issue with your site going unnoticed. Your website can collapse because of all sorts of reasons but not database related matters. The second option is to hire remote database administrators to look after your database. The arrival of internet technology changed how people do things. You work from home and get paid. People earn from their websites, just like you do. There are also people who earn by managing databases remotely. These DBA experts are in no short supply. phpMyAdmin is an open source software that you can employ in the management of your MySQL database. This is just too much work for most people particularly if you have other things that you should be doing. Who has time to learn PHP and MySQL? They can be quite technical. There are database administrators who have years of experience in the field willing to get that work done for you. Hiring a remote DBA service provider is a good option to start with. Why is this so? Regardless of how simple WordPress is to use, it can be difficult to manage its databases. Problems might arise that you will not be able to solve on your own. However, someone with expertise in the field will be able to keep your databases ‘healthy’ at all times. When you have a team of experts watching over your databases, it is hard to experience any kind of problem. These professionals are able to notice when a problem is about to arise and remedy it in advance. If you have no experience in this field, you will have to wait for the issue to arise so that you can have it solved. Even watch guards do not spend 24 hours watching over a place. However, with remote DBA service, you are assured that you will get a team of experts watching over your databases all the time. There will always be someone who will be checking your database to ensure that it is functioning at its best. It does not matter whether it is a public holiday or a weekend, your databases will always have someone looking after them. The same cannot be said of when you hire an in-house database administrator. They will have to go for the weekends. The amount of money that you will get to save when you have remote database administration is immense. For starters, you will not be paying an in-house administrator who you cannot keep busy enough. There are times when work will not be a lot. Therefore, your administrator will be seated in the office practically all day long doing nothing. These are just some of the many benefits of remote database administration services. There are companies that are providing these services. The companies manage the databases of other companies ensuring that data is kept as healthy as possible. Your database will grow intensely over the years thanks to the presence of good service. Data can help your business to grow only if it is available. When a database is managed properly, you will always have data available for analysis. This data will facilitate better decision making in regards to development of your website as well as provision of better services. When you have a team of database experts watching over your website, growth is inevitable. As your website grows, you will be collecting even more data. This is where data management experts come in. There are data IT solutions that are being developed on a daily basis to make management and analysis of big data a simple task. The major problem most businesses, and by extension websites, have with big data is the volume. When the volume of data being generated by a business is high, you might have a serious problem managing it. This is where DBA expertscome in to save the day. For starters, there is always data that is taking up space and yet it is irrelevant to the growth of your business. The DBA, while keeping an eye on your business, will ensure that your data is as clean as possible. Secondly, you will have the security of your database and its contents maintained at all times. This is one of the benefits of hiring a database administrator. They will set up backups for your database ensuring that they are performing at their best. Unauthorized entry into your database will also be addressed. It is not just anyone who works in the company providing you with DBA services that will have access to your content. Most companies assign projects to specific individuals. This way the person assigned your database learns its specific needs and is able to provide excellent service at all times. As aforementioned, you will not have to worry about the cost of these services. DBA services are provided at the most affordable rates and you will always have options to select from. There are several companies that provide these services so you can select the best rates available.